Be sure to enter to win our fabulous prizes! Read all about our favorite things and surprises! Last year we blogged about our favorite non-school related things, so this year we've decided to share our favorite school things! This fall I discovered the Word Clouds for Kids app in the second grade activities section of the www.abcya.com website. Now I use it all the time in my language arts lessons to reinforce a variety of concepts and skills. Synonyms, antonyms, parts of speech, figurative language....you name it...Word Clouds for Kids helps me provide my students with a great way to build vocabulary knowledge. Both the website and app are free for both iPads and desktops, and are kid-friendly to use! Here is a screen shot of a list of my favorite things that my students helped me brainstorm. They called out this list of nouns and verbs as I typed, and then helped me choose the font, color, and layout before we printed! Please note that they know that I love pie and Snickerdoodles! I've seen other teacher-bloggers use this app to create end-of-the-year gifts for their students using their names as well! Just create, print, pop it in a fun frame from the Dollar Tree, tie it with a ribbon, and you are good to go! A sample that I made about my daughter follows. Maybe Santa will tuck it in her stocking on Christmas Eve?!?! Staying organized as my school days roll on at a hectic pace is VERY challenging for me! During weeks when I have to progress-monitor, introduce a new unit, change my classroom's seasonal decor, and attend an assortment of meetings before and after school, my materials, resources, and papers often end up in PILES instead of FILES. This year, I am trying to "tame the beast" by creating thematic bins for myself so that I can just "grab-and-go" as needed. The bin pictured here contains all of the mentor texts, task cards, printables, and sample projects related to my January snow unit. It will come down off of the shelf and live under my teaching table as sort of a portable file cabinet at the beginning of the month, and then return there when our unit is done. I found the mid-size containers at my local Dollar General, and I love them because they are not too big or heavy! I've been collecting book-related stuffed animals throughout my 24 years as an educator. 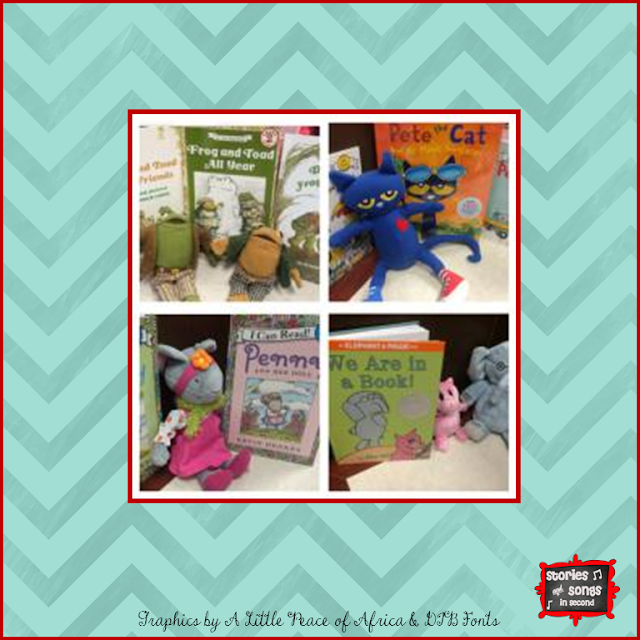 Small gift shops, Scholastic orders, Barnes & Noble, Amazon, and my local toy store are just some of the places I've found these favorites! I've always used my "book buddies" as a way to "set the stage to engage"--something that Hope King from Elementary Shenanigans and Ron Clark advocate as a way to capture student interest and draw them into the learning experience. I've always incorporated a bit of theater and creative dramatics into my lessons, so using my book buddies as puppets to help my group retell a story just comes naturally! Book buddies also make great "listeners" when it is time to read with a partner! I also "put them to work" as a way to reward positive behavior choices, and send them out to live on student desks in little buckets! They are also a great way to help students make text-to-self and text-to-real world connections, and develop oral language skills. Room #2 often sits in a circle before our morning and afternoon read-aloud lessons, passes the related book buddy, and shares their prior knowledge of the story topic. What a fun way to build schema, right? Passing a book buddy around after reading also provides a great opportunity for students to share a personal experience or memory sparked by the story. And now on to our delightful collection of possible prizes! Check these out! Complete the the Rafflecopter to win these prizes!!! a newsletter, so leave your e-mail via the sidebar to get on my mailing list! Continue to write yours, hold a song in your heart, and teach your children well! Be sure to visit my friends and enjoy all of their classroom favorites! You are so sweet and talented Jennifer! Great post! Thanks so much for your kind comments, Laura! It's a pleasure participating in the events you organize! I love your book buddy collection! That's so cool. Thanks so much, Barbara! The Gingerbread Baby is coming out for read aloud tomorrow! Jennifer, I love the 'Word Clouds'! I'm on my way to make some for Christmas! And your blog is beautiful! So glad your like the blog re-do! I love the "tribal vibe" Laine designed for me!